Although I am not the biggest chocolate fanatic around, there are times (ladies, you know what I’m talking about) that I develop a seemingly insatiable craving for its delectable goodness. When these urges occur, an ordinary chocolate chip cookie simply won’t cut it. I’ve come to terms with the idea that when these cravings hit, I’ve got to pull out all the stops. 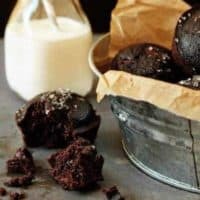 I’m talking chocolate ice cream with Homemade Hot Fudge Sauce, Symphony Brownies or these Chocolate Chocolate Chip Muffins. I’m a little obsessed with muffins in general – they are my go-to breakfast for lazy Sunday mornings. In my opinion, there’s nothing better than a freshly baked muffin, fresh fruit and a cup of hot tea to welcome you to a new day. 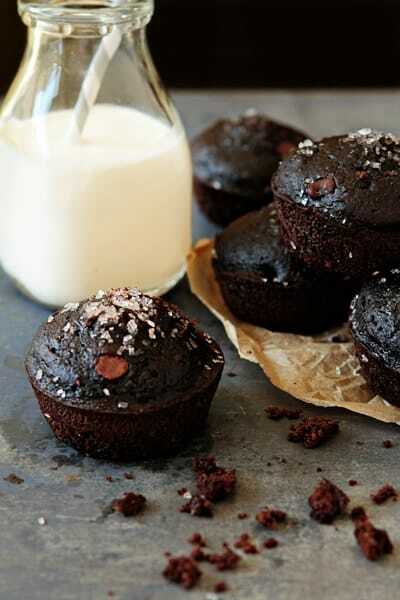 Chocolate Chocolate Chip Muffins? Ecstasy on my breakfast plate. You’re sure to have a good day when you start it out this way. 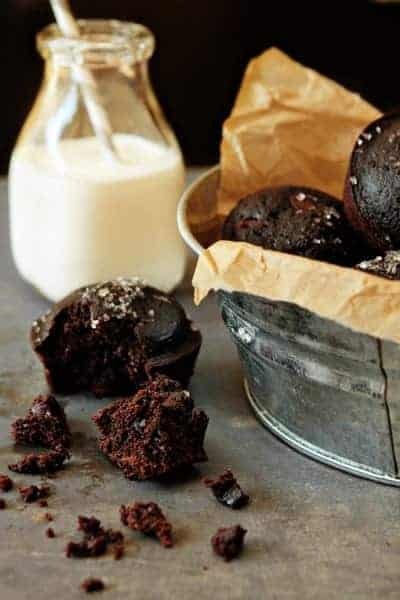 These delicious, dark chocolate muffins aren’t over the top sweet, so you won’t feel too guilty about indulging in one as a mid-morning snack. The addition of espresso takes the chocolate experience to whole different level while the semi-sweet chocolate chips offer a little texture and added sweetness. If you like a little crunch in your breakfast, add some walnuts, sunflower seeds or pecans. They’d all be a wonderful addition to an already pretty phenomenal breakfast experience. I’m thinking they’d be pretty great on your Easter brunch table too. 1. Preheat the oven to 400 degrees F. Lightly grease a standard muffin tin, or line with 12 paper muffin cups. 2. In a large bowl, combine the flour, baking powder, baking soda, cocoa, sugar, and 3/4 cup of the chocolate chips. 3. In a medium bowl, combine the milk, oil, egg, dissolved espresso granules, and vanilla; whisk to combine. 4. Add the wet ingredients to the dry ingredients and stir until just combined. Batter may be slightly lumpy – that’s okay. 5. Divide the batter between the prepared muffin wells. Sprinkle the remaining 1/4 cup chocolate chips on top of the muffins. 6. Bake in preheated oven for 18-20 minutes or until the muffins are dark, risen and springy. - I sprinkled the tops of my muffins with a little coarse sugar for added sparkle and texture. - The muffins are best served the day they are made, but will keep in an airtight container at room temperature for about 1 day. - If you don't have dark cocoa powder, you can substitute regular unsweetened cocoa powder. - If you don't have instant espresso granules, you can simply omit this ingredient.